This is a great post from “A View from the Bench”. I enjoy it because it’s what I’ve been thinking to myself all offseason, only in words. 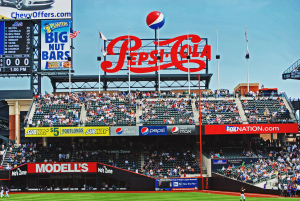 Personally, I wouldn’t be surprised if Gary Cohen calls it the Pepsi Porch during his dramatic Home run calls! It will always be the “Pepsi Porch” to me. I was awe-struck the first time I walked into Citi Field. I went to the first event there, a St. John’s University baseball game just before the opening of the 2009 MLB season. Everyone was there for the same reason, to bask in the glory that was now ours. A brand, spanking new stadium! Oh, I know everyone waxes nostalgic about Shea Stadium and it’s charm and history and all that. But it was a dump. It was OUR dump, but a dump none the less.